In April 2003 we were please to receive an email from Kenny Eggers himself! Here is his message. Kenny, if you read this, send us more of your great pics and stories. The people who visit this site would love to here more from you! I really enjoyed your web site, data & pics. I raced a WR from 1949 to 1952 in the USA, National No. 59 for Tom Sifton H/D Dealer, San Jose, Calif. A couple of years ago I decided to build a replica of that WR, pics attached. Also enclosed pic of me 1951 Tulare, Calif. 1/2 mile with my WR. Keep the shiny side up. Tom Sifton probably wont like this article. Throughout a career heavy with proof of the mans really amazing talents hes maintained a consistent keep me out of it policy. But his works speak for him. Sifton is the genius whose tuning has produced this seasons hottest Harley-Davidson machines. He looks after Larry Headricks screaming Harley 45 and on it Larry has distinguished himself as the first man in history to win the 15, 20, and 25 Mile National Championship races in succession on mile dirt tracks. Kenny Eggers, phenomenal Amateur, has had the same experience astride another Sifton iron. To date, this seasons outstanding Sifton wins: Expert Headrick, first at Bay Meadows, Portland Meadows, Springfield and Milwaukee; Amateur Eggers, first at Stockton, Bay Meadows and Springfield. And it hasnt been happening just this season. Until his retirement in 1947, the amazing Sam Arena, riding a Sifton Harley, almost stymied the sport by his steady and consistent wins over a long period of years. 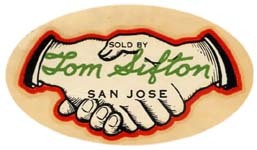 Tom Sifton was born in Buffalo, N.Y. in 1903, and came to California in 1918. Simultaneously, he went to work as an apprentice toolmaker and to night school to study mechanical engineering. Tom loved his work and the time invested paid off. At 19 he was made foreman of the tool design department of a big San Francisco manufacturing firm. This unusual success would have kept the average kids nose to the stone, but Toms interest spread out and finally caught up with motorcycles. In 23  he was 20 years old  he bought his first motor, a 1916 61-inch F head Harley JD. He cow-trailed with this beast for a couple of years, then began playing with its innards. His competition career began in 24 at the Girard Hill Climb near L.A.; he had stroked his eight-year-old model and won the Novice event. Sifton really started the boys wondering when he ran at the Pismo Beach Rally in 26. Curly Fredericks rode the Indian 8-valve that had set the worlds record at Daytona that year. Siftons homegrown job fell short of this machines straightaway time by one-fifth of a second! It was years before anyone knew how Tom had done it: he had milled out the inside of the motor base and built his own, invisible, super fast, twin-cam action. Sifton had the edge on the boys; he was a highly-trained craftsman and engineer, with an instinctive feel for machinery. The toolmakers code had been drilled into him: It must be round and straight and square and smooth. He kept his machinery that way, made it so when it wasnt already  and he thought way, way ahead. He designed his own deflector-type pistons, became a wizard with cams, could look at a hill and call the winning ratios, made his own manifolds, knew the traction characteristics of every tire. He was one of the prime movers in converting the Old Guard to progress. Turning point for the West Coast was at the Pismo Beach Rally at 1930, where one of the first American TT races was held. Against 80 strokers with 3-inch high pressure tires and rear wheel brakes, Tom entered and rode a tuned 45 with 4-inch high pressure tires, two-wheel brakes, downdraft pots. He won the race in a breeze, braking smoothly in the turns while the competition overshot the course in trying to follow him. He won the West Coast Hill Climb Championship in 30 and retired from competition. Siftons retirement coincided with an offer of an H-D sub-dealership in San Francisco. His sub-agency at 530 Valencia St., San Francisco, did well from the start, and, almost from the start, Horseface Klotz Jim Young began riding Sifton-tuned Harleys, and on them established himself as top man in Northern California  the man who could win any race on a wheelbarrow. From the beginning Tom knew that machines, riders, or tuners dont win races by themselves. To be consistently successful all these factors must be good in themselves and carefully combined to produce a dependable, functioning unit. Tom was married in 1930 and a daughter was born the following year. For reasons best known to himself, he moved to San Jose in 33 to take over the H-D agency there. A 19-year-old kid appeared on the scene almost immediately, looking for help for his budding racing career. His name was Sam Arena, and Sifton somehow spotted the potential material bottled up in the boy. He built Arena a machine for the 1/5 and 1/4 mile short track racing that was being popularized then by Sprouts Elder. Arena went right up the ladder, with Sifton putting the steam in his iron. One of the highlights of Sams career was at the 1938 200-miler at Oakland when he bettered the existing record by more than 10 mph! In the Oakland race in 39, Arena had a lap lead at 108 miles, blew off a front cylinder. In 40, Sam had a broken arm, so Louis Guanella rode the Sifton product to victory, stepping up the average record by another mph. Class C half-mile racing became popular in 1940, and Arena went through the 40 and 41 seasons without being beaten in a half-mile event. The war came and went but nothing changed: in 45, 46, and 47 Arena was never beaten in a quarter or half-mile race; for two years he never lost a heat! On Sifton motors, of course. Arena retired from racing at the end of the 47 season and so did Sifton  temporarily. The next year Tom got back into the harness, helped two young novices get going: Bob Chaves and Al Rudy. Both went to Daytona in 49, sat in front until Rudy dropped out with a flat and Chaves had to make two pit stops with a defective gas tank seam. Notwithstanding, Chaves finished second. Larry Headricks racing ambitions came on in 41. Living in San Jose, he bought a WR from Sifton, practiced, raced, moved back East, came back to San Jose in March of last year, (1949) went to work for Sifton as a mechanic, and began entering all the Northern California races. He quickly mastered the Belmont 1/4 mile, won his first 1/2 miler at Galt that July, another at Napa a couple of weeks later, and from then on was definitely to be reckoned with. The rest is current history. Another member of the Sifton family of champs is Amateur Kenny Eggers, who appeared at the San Jose shop at the start of the season, looking for the touch of the master tuner. He got it, went right to town, set Belmonts fastest lap record, has won every mile track race that hes competed in. The Bay Meadows show was perhaps the high point of Sifton success to date: everybody who could ride or who thought he could was there  and against that field the San Jose/Sifton boys made a clean sweep. The boys that ride for Sifton feel for him a respect that approaches worship  and thats not an exaggeration. I asked one of these riders what he could tell me about the man who had tuned his racing machines when he was a top competitor.